The subscriptions to packs and the subscription to a plan are separate, allowing you to manage them independently; this enables you, for instance, to restart your plan early if you have consumed all your credits, or to subscribe to a pack temporarily for a PoC without modifying the settings/payment of your plan. All our packs are also available for trial during a 30 day period. To start the trial period of any of the packs, you just have to log into MeaningCloud, and click on the corresponding ‘Start trial‘ button. You will get access immediately to all the resources included in the pack, allowing you to use them from your preferred way of using MeaningCloud: one of the Excel add-ins, any of our SDKs or your own integrations. In the subscriptions section of the developer area, you will be able to see all your subscriptions — plan and packs — as well as the packs you currently have on trial. In this view, you will find all the information and operations associated to your subscriptions. 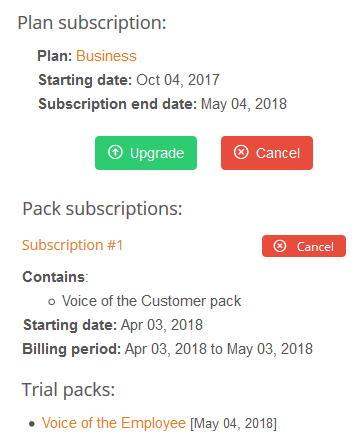 For each subscription, you will see its renewal date, its billing period as well as its corresponding “Cancel” button in case you want to cancel it. In the case of the plan subscription, you will also find an “Upgrade” button to access the upgrade process that allows you to change the current plan. When you start running out of credits, a “Restart” button to renew early the plan subscription — and the credits available — will appear. The packs on trial will be accompanied by their expiration date, that is, the date until when you will have access to the pack and its resources (or in the case the date is past, when was the last time you had access to the pack). We hope you find the resources of our Vertical Packs and their flexibility highly beneficial. Don’t hesitate to send us your questions or feedback to support@meaningcloud.com: we will be happy to talk with you!